The voluntary members of the Observer Corps had provided a vital service in the Second World War. Following their unique and valuable contribution to the defence of the country during the Blitz King George VI gave approval to a change of name. 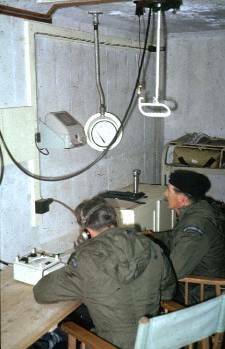 From that day in 1941 until they were stood down in 1992 they held the title of the Royal Observer Corps. Following the end of the Second World War a new threat was identified as Europe became divided by an `Iron Curtain` and war with the Soviet Union seemed like a real possibility. The Corps continued to assist the R.A.F. by supplementing the detection and monitoring provided by the rather limited radar equipment. In 1957 the United Kingdom Warning and Monitoring Organisation was formed. Now the members of the Corps found themselves with a new role : monitoring the onset and the after effects of a nuclear attack launched from the Soviet Union. A network of over 1500 underground posts were constructed. One of these was located on the top of Park Hall Hills at Weston Coyney. The ground adjacent to the Decoy Site Control Building, a reminder of World War Two, was selected for the site. This was an obvious choice because the location provides a good vantage point over much of the surrounding area. I have not been able to locate any photographs of the post on Park Hall Hills but Mr Gary Sutherland has kindly allowed me to use some of the photographs from his collection. The photograph on the left was taken at the post in Sandy, Bedfordshire. As I recall, this is how the post on Park Hall Hills looked when I saw it as a young boy. The large concrete structure on the right is the entrance/exit point, a steel ladder leads to the working area 15 feet below. The official name of the post was `Longton` and it was opened in 1965. It had a short operational life, closing in 1968 it was one of the first to fall victim to the changing perception of the nuclear threat. A series of improvements were made to the wartime air-raid warning system to alert the population in the event of a nuclear attack. The United Kingdom Regional Air Operations Centre would receive a notification from the `Early Warning System` and could in turn trigger a nationwide network of sirens and special broadcasts on radio and television. The members of the Corp who were manning the posts had three main tasks. 1. To record the altitude, size and bearing of any detonation. 2. To record and identify the peak blast pressure created by any explosions. 3. To record the levels of radiation fallout, monitoring the peak rate and the rate at which the radioactivity decayed. The results of the monitoring were relayed to Control Centres so that a national assessment of the scale and impact of the attack could be made. It was thought that many people could avoid the fallout by finding adequate shelter. The monitoring carried out by the Corps would make it possible to inform people when it was safe to venture outside again. The photograph on the right shows two members of the Corps in their post at Sandy. 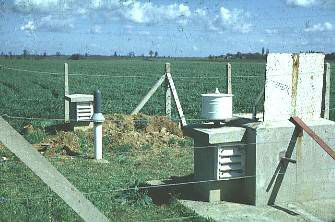 The monitoring instruments are connected to sensors mounted on the ground surface above. These can be seen in the first photograph as can the air ventilation shafts. The post at Park Hall Hills has been demolished and the excavation filled in but it is still possible to find traces of where the post was located. The remains of the wartime Decoy Site Control building can still be seen overlooking the Fir Tree Plantation, the R.O.C. Post was located a few metres to the north west.